Exclusive UK and Irish Mimaki distributor, Hybrid Services, has announced that the new Mimaki LA-160W is now available for demonstration at its Crewe-based showroom. 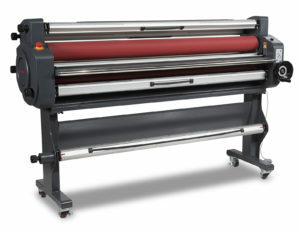 Designed to complement the popular UCJV Series LED UV printer/cutters, along with other staple products from its sign and graphics ranges, the Mimaki LA-160W laminator is available at 158cm wide and is heat-assisted to a maximum temperature of 60˚C. This heat assistance improves overlaminate film adhesion, particularly to surfaces printed with UV curable inks and reduces the potential for the silvering effect created by pressure sensitive overlaminates. Hybrid’s chief operations manager, Brett Newman, said: “Thanks to their instant curing, LED UV inks tend to have a slightly uneven surface which can trap air bubbles during the laminating process, causing silvery specks that can take away from the appearance of the product. 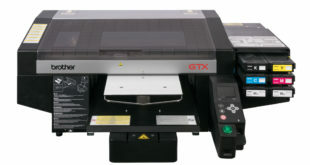 The Mimaki LA-160W sports fast laminating speeds of up to 7.5m per minute and is simple to use, thanks to it containing all its functions on one control panel. It features convenient access to the pressure handle and foot pedal and a take-up reel enables one operator to control the entire process.